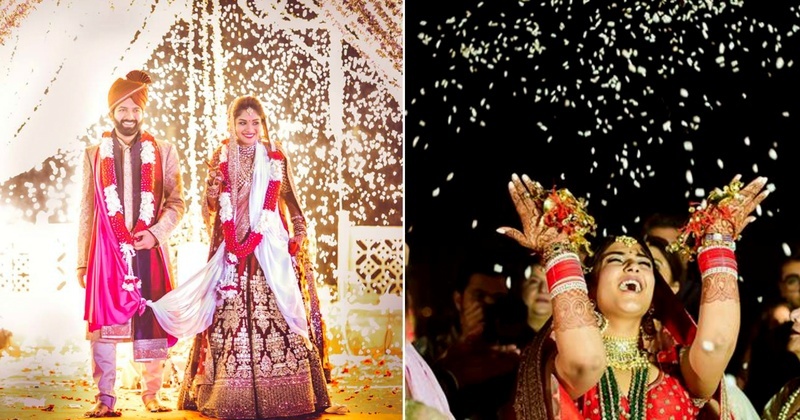 Fun & Interesting Facts about Indian Weddings that are worth a read! While most of us follow Indian wedding traditions & rituals, hardly anyone of us knows the reason / meaning behind them. So, I decided to take a step back & actually find out the reasons behind most of these wedding rituals & trust me, you’ve got to read about it! Everyone knows that the darker the bride’s mehndi, the stronger her marriage will be! Another belief is that if the mehendi lasts longer on the hands of the bride than her fiance’, she’ll be loved a lot by her in-laws! Weird, right? Engagement and wedding rings are worn on the fourth finger of the left hand because it was once thought that a vein in that finger led directly to the heart. The romans even called this vein the "vena amoris" or the ‘vein of love’. Brides traditionally wear veils because ancient Greeks and Romans believed they protected her from evil spirits. We, Indians wear the ghoonghat for the same reason as well! Apart from being the symbol of matrimony for a Hindu woman, sindoor (red vermilion powder) has some great health benefits as well. It contains turmeric, lime, and a minute level of metal mercury. In Hindu and Sikh cultures, brides tilt the ‘kalash’ with their right foot, containing food grains on the threshold of her new house. This symbolizes that her addition to the new house will bring health and prosperity to the couple’s life! In a lot of traditions, the bride’s mother playfully catches the groom’s nose - this is to remind him to always treat her daughter well. A similar ceremony exists in Marathi weddings called ‘kaanapalli’, where the bride’s brother playfully twists the groom’s ear to extract a similar promise from the groom. Funny, isn’t it? The Vidaai ceremony is usually the most emotional part of any wedding! Some cultures believe that more the bride cries at her vidaai, the happier her married life will be! Do you know why he wears it? Well according to a popular belief - the sehera will protect him from all the buri nazar! While the dowry system is no longer prevalent, many parts of the country still see the groom receiving handsome amounts of money from the bride’s family. The converse is true in Indian Muslim weddings. A custom called Meher is followed, where jewellery, cash or other valuable gifts are given to the bride by the groom before and after consummation of the marriage. Well well, its 2018 and can we be done with this already? It is considered very rude to wear just black or white to a Hindu wedding as these are considered colours of mourning and thus are inauspicious! Although, different shades of white arequite popular today and many modern brides choose white lehengas or sarees with colourful borders and embellishments. And why not? Calm down all the bridezillas who are scared that it might start raining on your wedding day! There is no need to be gloomy. As it turns out, that though it may dampen some of your decor, it’s considered to be an auspicious omen - it’s a good sign for fertility for the married couple! It’s customary for nayi dulhan to prepare something sweet when she sets foot in her kitchen for the first time! It’s believed to bring in good fortune to her new life! Here’s hoping that you know to make a dish or two :P! Throwing rice at a wedding is considered to be very auspicious. It is a sign of abundance and fertility as well as a way to protect the newlyweds from the evil spirits. In some traditions especially in Sikhs, the to-be bride is given a knife (kirpan) to carry after her engagement till the time she gets married. It is believed that the object will protect the bride from evil and/or negative spirits. It’s believed that if there is a full moon one or two days before your wedding day, then your married life will be filled with good-luck and happiness. In the Punjabi community, the brides wear a ‘Chooda’ (a set of red and white bangles) for a few months into the marriage, to bring them good luck in their new home. Christian weddings are preceded by a fun ceremony called the bridal shower. This is an event usually hosted by the bride’s female friends with a lot of music, dance and games. The bride then serves a pink cake to everyone present with a piece of thimble hidden inside. It is believed that if an unmarried girl gets this piece of thimble, she will get married soon. 21. Ever wondered where the phrase "tying the knot" came from? In many cultures around the world including Hindu, Celtic, and Egyptian weddings — the sister of the groom ties several knots in a long string and the bride and groom are supposed to use one hand each and work together to open the knots. It is believed that the sooner they untie the knots, the smoother their wedded life will be. In this coming-home-after-the-wedding game, a ring is hidden in a container filled with milk and vermilion. The bride and groom are then asked to dip their hands into the bowl to search for the ring. The one who finds the ring four out of 7 times is predicted most likely to dominate the other one! Queen Victoria is credited with starting the Western world's white wedding dress trend in 1840 — before then, brides simply wore their best dress. Well, now that’s what we call a #TrendSetter! According to very ancient global tales, couples went into hiding after the wedding, and a family member would bring them a cup of honey wine for 30 days — or one moon — which is how the term "honeymoon" originated. Well, these are just some interesting superstitions related to Indian weddings, however, not all of them are true! Marriages are based on love, trust and understanding and last a lifetime irrespective of whether you follow all these traditions or not.